Summary QCA-based AC1200 class router with Gigabit ports, USB 2.0 storage sharing and VPN servers. Our last look at an EnGenius router was the EnGenius ESR750H last August. 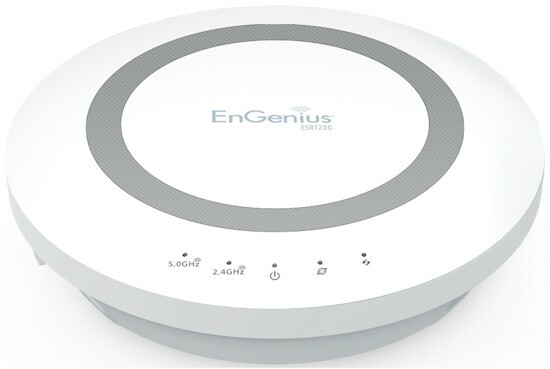 With EnGenius' launch of its 802.11ac routers, it's time to take another look. We'll start with the ESR1200 AC1200 class router and follow up with a review of the top-of-line ESR1750 in a week or so. The callout diagram below describes all the lights, ports and switches. The front panel LEDs show separate 2.4 GHz and 5 GHz traffic, Power, WAN Status and WPS Status. We throught the ESR1200 was going to be the first QCA-based 11ac router we reviewed. But NETGEAR's R6100 snuck in and took us by surprise. We initially didn't take apart the ESR1200 and instead relied on the FCC ID photos that had close-ups of all the key components. It turns out, that was a bad idea because the actual products are very different from the product shown in the FCC ID internal photos. The FCC ID photo shows three antennas and components loaded in all three RF chains. The actual board shown below has only two antennas per radio and all different QCA devices. It appears that instead of using the same exact hardware as the ESR1750, the ESR1200 actually is an AC1200 design. The ESR1200's key components are summarized in Table 1 beside the NETGEAR R6100, which is included as currently the only other AC1200 class router using QCA devices. The designs are quite different.